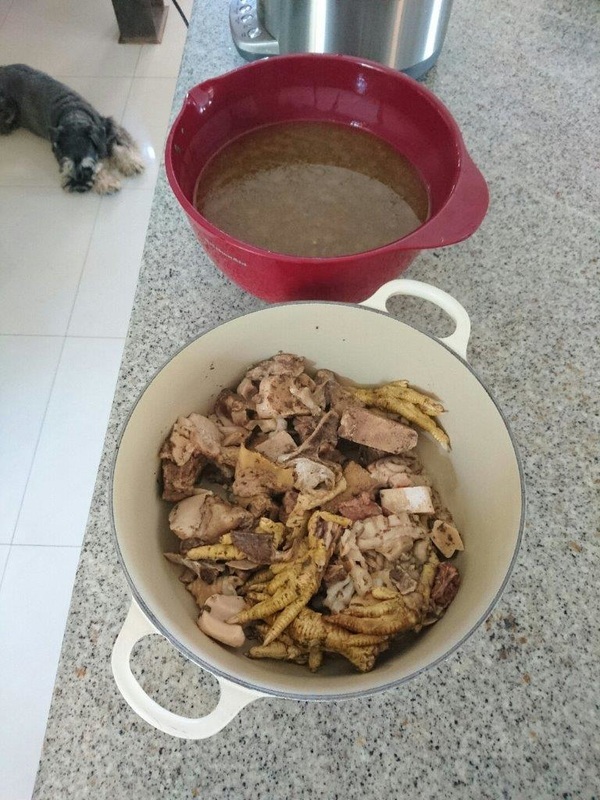 Read about how to make schnauzer mom Nicole's bone broth. Bones are full of all sorts of good minerals like calcium, silicon, sulphur, magnesium and phosphorus. This is one of the reasons that many people choose to feed their dogs raw meaty bones. Please see our article Bones: the good, the bad and the ugly for further information on the topic of raw bones. But not everyone wants to give their dogs bones and there are circumstances when bones are not suitable for dogs. Some senior dogs, sick dogs or toothless dogs will not cope with chewing bones and so a bone broth is the ideal way to provide all the goodness of bones without the chew. Bone broth is the nutrient dense gelatinous liquid made from simmering raw or cooked bones at low heat over a long period of time. It is especially good for sick dogs and senior dogs, as it is extremely easy to digest and is soothing for the gut. It's important to understand that bone broth alone is not a balanced diet. Even if your dog absolutely loves it, they need more than bone broth to be healthy. Rather, it is a great way for you to offer extra nutrition in a doggylicious form! It helps to maintain a healthy gut and thus is especially helpful for dogs with digestive problems. The lining of the intestines contains millions of tiny holes that allow the passage of digested nutrients to enter the body. Stress, poor diet and bacterial overgrowth can cause more or bigger holes to form which allow things to pass through that aren’t meant to. This is called a “leaky gut”. The gelatine in bone broth soothes the irritated gut and effectively plugs the holes. Bone broth also helps to protect dog’s joints. Bone broth is loaded with glucosamine a very special molecule that helps keep joints healthy. It’s also packed with other joint protecting compounds like chondroitin and hyaluronic acid. Bone broth can also benefit dogs with allergies and food sensitives, as it is a phenomenal immune system booster. Bone broth is nutritious and healing for sick dogs. It is a great first food for dogs recovering from illness. If you have a dog that doesn't want to eat anything, feeding bone broth provides very concentrated nourishment and helps get the GI tract functioning again. It is a liver detoxifier. The liver is the master organ of detoxification. Our dog’s liver is under assault daily from carpets and floors treated with chemicals, grass that’s been treated and sprayed with poisons, foods with synthetic ingredients, de-worming medication, flea and tick preventatives, vaccines and more. The amino acid glycine found in bone broth aids the detoxification of the liver. I use a slow-cooker, but a pot on a stove will work just as well. You will need a good selection of any type of bones including a few marrow bones, some chicken feet and/or sliced cow heels enough to ¾ fill your pot. You may also add a crushed clove of garlic for added health benefits if you choose. Recently the safety of garlic for dogs has been in the spotlight. That’s because one research study used excessive quantities in their tests. When dogs are fed very large amounts of garlic it can cause damage to red blood cells leading to Heinz body anaemia. Based on this study, a small dog weighing 6kg needs to eat 25 grams of garlic – about half an entire head of garlic (or about 6 to 8 cloves) every meal to experience any adverse effects. Fill the pot with water so that the bones are deeply covered and add 3 – 4 tablespoons of apple cider vinegar. The apple cider vinegar pulls the nutritious minerals and gelatine out of the bones. Turn the slow-cooker or stove on and let it come to a gentle rolling simmer. Then turn it down and cook on the lowest heat possible for 24 hours. Once the broth has cooked for 24 hours, turn off the heat and leave it to cool to room temperature. Then strain out all the bones and discard them and put the bone broth in the fridge. 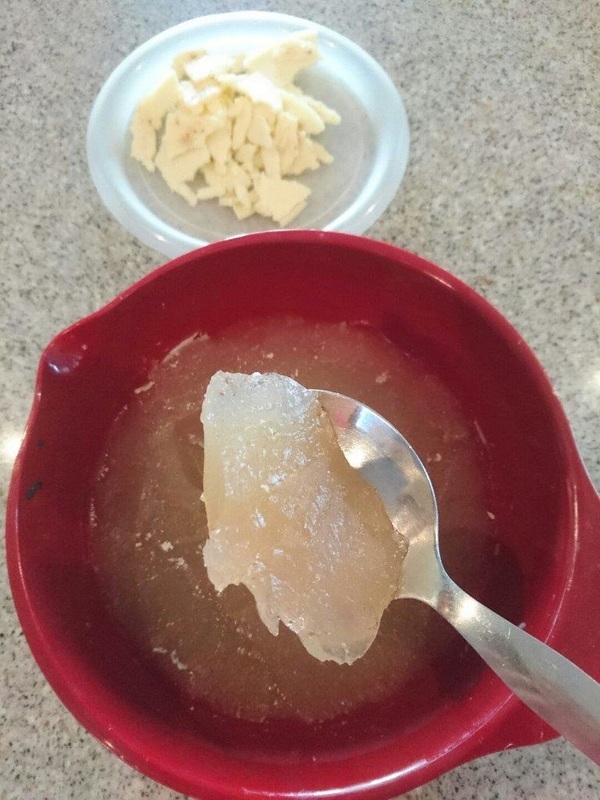 Once your broth comes out of the fridge, it will have a hard layer of fat on top. Remove the fat and discard it. Underneath the fat the bone broth should now look like jelly. If your broth hasn’t jellified then you know for next time to either add a little more apple cider vinegar or a few more gelatinous bones like chicken feet or cows heels. But relax: this is not a train smash! You can still use this bone broth because it contains all of the good nutrients even though the gelatine content is low. To store your bone broth, you can scoop it into a sealed container and keep in the fridge for up to 3 days or scoop spoonsful into ice cube trays and freeze it for up to 3 months. Bone broth is added to meals but not counted as part of the daily allowance. Think of it as a “vitamin” for dogs. 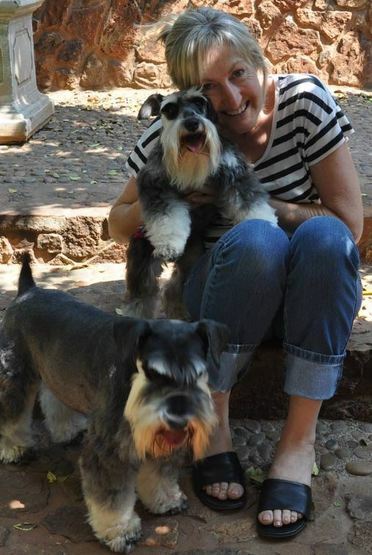 For a Schnauzer sized dog a tablespoon (about the size of an ice cube) per meal is the perfect portion size. Because my dogs (just like my children) won’t eat their veggies I use the bone broth to cook their veggies and then freeze the broth and vegetable mixture in ice cube trays. I add a 1 cube serving of broth cooked vegetables per meal. The saying goes that when life gives you lemons, make lemonade. I think this Schnauzer yummy mummy can improve on that: when life gives you bones delicious nutrient packed bone broth jelly!